Today's FluView report from the CDC contains word of two more H3N2v cases - this time connected to a county fair in Ohio - in addition to the 2 H3N2v Cases Connected To Muskegon County Fair I wrote about last weekend. First the announcement, followed by a brief media report, then I'll be back with a bit more. Four human infections with novel influenza A viruses were detected in two states (Michigan  and Ohio ). 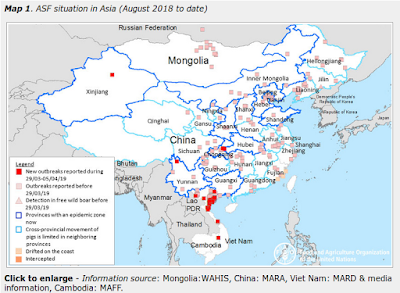 All four persons were infected with influenza A (H3N2) variant (H3N2v) viruses and reported direct contact with swine in fair settings during the week preceding illness onset. Separate swine exposure events at fairs in each state are associated with infection and there is no indication that the cases in different states are related. Swine influenza A (H3N2) virus was identified from at least one respiratory sample collected from pigs at each of the associated fairs. Public health and agriculture officials are investigating the extent of disease among humans and swine, but no increases in influenza-like illness in the communities have been reported. Early identification and investigation of human infections with novel influenza A viruses are critical to ensure timely risk assessment and so that appropriate public health measures can be taken. 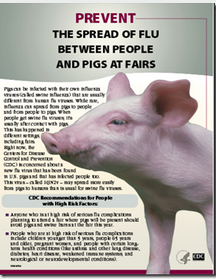 Additional information on influenza in swine, variant influenza infection in humans, and strategies to interact safely with swine can be found at http://www.cdc.gov/flu/swineflu/index.htm. The AP is reporting that the Ohio cases were contracted in late July at the Clark County Fair, and that two children were infected, with neither of them hospitalized (see Ohio officials: 2 children get flu from swine at county fair). Swine variant viruses (H1N1v, H1N2v, and H3N2v) are swine influenza viruses that are labeled as `variants' after they have jumped to a human host. Over the past decade we've seen nearly 390 cases reported across the country, with the bulk of those related to a multi-state outbreak at county and state fairs in 2012. Of the three swine variant strains reported in the United States, H3N2v has been the most common, making up 94% of all reported cases. On July 1st, we saw Fluview Week 25: 2 Novel H1N2v Cases Reported (Wisconsin & Minnesota), bringing 2016's total to 4. With the 4 reported by the CDC today, we are now up to 8. While only rarely reported, given the limited testing and the (usually) mild presentation of the illness, it is likely that far more cases occur each year than are reported. We’ve not seen sustained or efficient spread of these swine flu viruses in humans - but like all flu viruses - swine variant viruses are capable of evolving, reassorting, and adapting to their hosts. People who raise, or work with pigs are probably at greatest risk of infection, but County and State Fair animal exhibits also provide opportunities for these viruses to jump to humans. The CDC offers the following advice to the public.